First let me say, I really do sincerely love and respect Derek and Sharon Gilbert, Tom Horn, Josh Peck and the rest of the gang over at SkywatchTV. Whatever they may think of me, I still enjoy watching, listening to and reading their stuff. However, they really should have actually done at least a little bit of serious research before taking on this subject. This was embarrassing. It appears they probably just watched a couple of videos by VSauce and a few other equally un-informed opponents of the flat Earth model to form their argument. For instance, NO ONE I know in this research believes that gravity is the result of the disk of “the Earth accelerating upward at 9.8 meters a second.” From what I understand, that was nonsense put out by The Flat Earth Society, which most seem to regard (now) as “controlled opposition” and not a good source for truth concerning this issue. There are many other equally absurd “evidences” presented in the above video, but the worst of all is the exceptionally flawed concept that is summarized in what is theologically known as the Doctrine of Accommodation, which is the escape route they have to use in order to get away from the indisputable fact that Holy Spirit inspired authors clearly wrote in terms of an enclosed, flat world cosmology. But then, all of these people – even after fully acknowledging what the Bible CLEARLY says – will then turn around and nullify Divine inspiration and toss out any notion of the inerrancy of Scripture with their absurd Doctrine of Accommodation rationale. And what’s worse, is at the end of the above SkywatchTV broadcast, in an amazing bit of irony, the sales pitch was for the validity of the Book of Enoch, which again is a flat Earth book. In fact, it is a SLAM DUNK for the flat Earth cosmology (pay especially close attention to Chapter 89:1-8)! The good folks over at Skywatch and people like Dr. Heiser love Enoch for all the goodies it presents for a greater understanding of the Watchers and the Nephilim and all that jazz, but that information is only a tiny fraction of what Enoch discusses. In fact, you might as well tear out chapters 72 through about 90, because those chapters make absolutely no sense whatsoever if you have a spinning, heliocentric, globular Earth cosmological worldview. 2 Corinthians 11: 14 And no marvel; for Satan himself is transformed into an angel of light. 15 Therefore it is no great thing if his ministers also be transformed as the ministers of righteousness; whose end shall be according to their works. Anyone who’s works directly contradict Scripture shall remain HIGHLY suspect in my eyes. And that suspicion is only compounded if said “Christian astronaut” is also a Freemason – as in the case of Jim Irwin, who ironically enough ALSO supported Christian Science, was an outspoken person against evolution, BUT is credited with finding the so-called “Genesis rock” (allegedly on the moon), which was dated to be about 4 billion years old… which directly contradicts the Genesis account of Creation. As for this being a “distraction” and a source of “division” in the Body of Christ – consider well how you treat the TRUTH of Scripture and how you treat those of us who choose to believe in it 100% without compromising with such ridiculous ideas as the Doctrine of Accommodation. Those who think this is some sort of distraction from the Gospel would do well to read the Testimonies page of my website. The testimonies on that page represent a tiny fraction of the fruit that came in from this subject back in the summer of 2015. It has only exponentially increased since then. I receive many such testimonies in letters, e-mails, Facebook and phone messages on a daily basis now – many from former atheists. Why? Because the flat, enclosed world model can’t help but point people to a Creator. Whereas, the spinning ball going around an average sun, in an average solar system of an average galaxy, among billions of other galaxies in an ever expanding universe has – for centuries – led to people LEAVING faith in YHWH and trust in His Word. Why? Because the latter model clearly contradicts Scripture and atheists know it. In this regard, they are far more honest with the text than Christians are (at least concerning this topic). Evolution is seemingly plausible in the standard model cosmology. So also is the notion of “Ancient Aliens.” And now, Christians are also embracing both ideas. You have Christians who claim to believe the Bible, but leave room for Evolution. And you have Christians who also leave open the possibility of alien life “out there” in the cosmos. But all of that is quickly obliterated in the enclosed world, Biblical cosmology. I have come to believe that this enclosed world, Biblical cosmology is rising to prominence and being actively discussed for the first time in five centuries again in the 21st Century for a very good reason. This game is coming to a close. Hence, DECEPTION is going to be on a MASSIVE increase. Some are saying that FE is that deception. I’m going to have to strongly disagree. The Biblical FE model points people TO YHWH and the truth of His Word. All of this other crap does not. In fact, it directly contradicts Scripture and renders YHWH a liar. So, which is a better candidate? I should think the answer is obvious. Meanwhile, NASA (and other “space agencies”) are increasing their UTTER NONSENSE about more and more alleged “habitable earth-like planets” out there these days. I absolutely believe this is all a build up for a capstone to the GREAT DECEPTION that is likely going to roll out in full force in the very near future. I believe lines are being drawn in the sand right now. Which side will you be on in the days ahead? The side of secular, largely atheistic “science” that consistently calls YHWH a liar or the side of Holy Spirit inspired Scripture that points to an amazing, loving, un-changing Creator who does not lie? After nearly 2 years of dedicated research on this topic, I’m now of the firm conviction that this is a critically important issue and well worth all the time and effort I’ve put into it – regardless of the CONSTANT ridicule. In my opinion, Skywatch probably should not have even bothered to tackle this issue, because I don’t think it will go well for them. I wish no ill-will toward them or anyone else, but something is happening with this subject. It’s not going away and it’s not going this viral because people are stupid. Yeah, there are some issues that the flat Earth community still hasn’t been able to solve (give us a break – we’ve only had a couple of years to undo 500+ years of indoctrination). But there are at least as many problems the ball Earthers can’t solve either – the striking lack of curvature being a big one. But that’s a subject for many other, more lengthy discussions. For me, regardless of the various “issues” that remain unresolved, I’ve chosen to place my trust on the ONLY firm foundation we have: The Word of God. It says what it says and YHWH feels no need to apologize for it. The question then becomes, will we simply believe Him or make up excuses for why we don’t? I know what my answer is. What’s yours? Your counter-evidence of the proofs of flat earth are absolutely RIDICULOUS. Do a LITTLE research. And get yourself on both sides of the argument, honestly, before you shoot down a theory not easily accepted,. as flat earth completely is. None of us have come to this conclusion lightly. Any good lawyer or “journalist” would get themselves solidly on each side of the argument. And honestly, you ABSOLUTELY did not do that. Because if you did, you would have had, at the very least, reasonable arguments for the proofs the flat earth theory has shown. And, honestly, MANY of us have come TO Jesus because of this “theory”. The bible does not reference a globe earth. EVER. You know Rob I’ve followed you and your research for the last 2 years. It was very easy for me to accept the truth about FE because I do believe that God given words meant just what they said. In fact when I stumbled onto flat earth I actually felt relief. It made clear every question I had when reading Genesis and Enoch. And I don’t just read the word of God as a general story. I read it and believe it whole heartedly. I do think though that it is time to make a true commitment on your part. You have made the have argued strongly on why you are tempted to believe. And the strongest argument you make is that it is from Gods own word and from the description of what Enoch was shown. If you were to be taken today do you believe that it would be acceptable to be on the fence. Are you ready as a bride of Christ. If you can’t make a commitment with all you have researched and with all the knowledge you have been shown at this time. When will you. Don’t let the door be shut while your still trying to decide. God bless you for doing what you have done. You asked. You received. Now accept. Well now were part of the few. I was very surprised to find that my nephew who just last month was baptized. Also believes and now so does my sister his mother. It’s good to know there is someone to talk to about it and to all of us it brings a new light to our belief in scripture. The funny thing is that my other sister and her husband who were saved many years ago and teach the bible don’t even seem to look past the KJV of the bible. They feel they don’t need to know anymore. Maybe their right, I don’t know. I only know on through my search I found I had many questions. The more I read the more questions I had. The more I asked for discernment and that kept leading me to different writings(hidden books of the bible for one). I have gained more of an appreciation for and understanding of our savior and our creator. I’m still looking. Not so much for answers now and even then. But because it’s so darn interesting as well. By the way I did by your book. Genesis and the Synchronized, Biblically Endorsed, Extra-Biblical Texts Kindle Edition. Just got it about a week ago. Thank you. God Bless. I hope that you can forward that to their site, Rob. I love Josh Peck and Christina. They are fine people, but they seem to have lost their individuality when they joined the (very commercial) Skywatch team. Josh is more sophisticated and presents himself well in front of the camera, but he,I think, has to push their opinions, and not his own, anymore. .Into the multiverse is a fizzer, in my opinion. I am still deciding on the flat earth. I fought against it originally, but it certainly makes a lot of sense, and answers a lot of questions. Good for you, Rob, for sticking to your guns when everybody considered you to have taken leave of your senses. You’ve got guts. I am so disappointed by this, but I am learning quickly that in this matrix system of mind control we live in, if someone, even a highly educated, or enlightened someone, hears something that is completely against their programming, Agent Smith shows up to violently attack it, even without factual evidence. I feel that believers in Jesus are going to be severely tested in the upcoming days, and many will fall away because choosing God will seem ludicrous to the programming of this science religion programmed society. Dark Web content recovered by Mexican hacker. 5k to 7k up possibly touching the firmament or at least close by. After living here for 60 years, during my 61st year I read Enoch, and began to seriously concider everything that is contained in his record. Which has led me to reconsider everything I was taught about this place we live and how it is truly constructed. I’ve travelled extensively the width and breadth of this nation on the ground and in the sky above, and still was not convinced until I obtained the knowledge of Enoch and began to see the world through his eyes. I flew a Cherokee single engine plane of a friend at 12000 feet and saw for myself how flat the world truly is. Logic suggests that we believe our own senses before we believe someone else. I do now trust my own senses and can tell you with out any doubt in my mind that we live on the world as described by Enoch. Thanks to Rob Skiba for his detailed information which led me to concider the possibility that Enoch is right. At this age sometimes I think it would have been easier to remain in the dark, because like Solomon said, with wisdom comes sorrow! However thanks to my Father in Heaven for revealing this knowledge to us at this time. Good article Rob, I don’t see how people can dismiss the clear, simple understanding of what the Bible cleary teaches while professing to believe what the Bible says. It seems like many people are not enduring sound doctrine anymore and being turned to fables (I.E. Scientism). 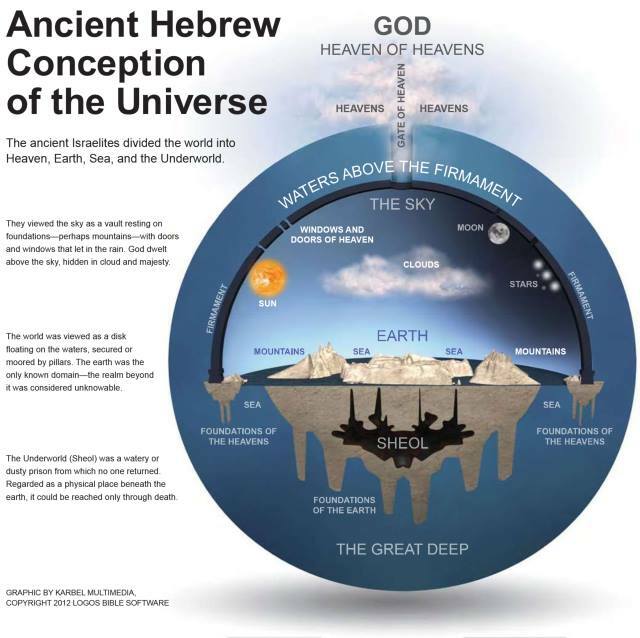 Again, many people appear to be very wise in the wisdom of this world…..
As far as believing the heliocentric model where the stars are suns like our own, the bible disagrees with that. 1 Corinthians 15:41 says: There is one glory of the sun, and another glory of the moon, and another glory of the stars: for one star differeth from another star in glory. The bible is clear that the sun is not a star. It differs and there is 1 glory of the sun and a different one for the stars. They are not the same thing. In the eyes of the world, modern Scientism, and many of your detractors and bible denying “friends” they are thinking you have become a fool. I would say they appear to be very wise in this world. Very wise indeed…. God says let him become a fool so that he may become wise. I think you have become very wise in the eyes of God. Keep up the good work. Remeber, But the natural man receiveth not the things of the Spirit of God: for they are foolishness unto him: neither can he know them, because they are spiritually discerned. Maybe this is why some people simply cannot see it even when the bible clearly states something, they see the complete opposite. In the spirit of your statement “words mean things,” it is interesting to note that when Genesis says God placed lights IN the firmament that a lot of people think that means that it is air because the sun moon and stars can’t literally be IN a hard canopy right? I mean birds fly IN the firmament so that can’t mean a snowglobe right? in 1. expressing the situation of something that is or appears to be enclosed or surrounded by something else. Hmmm.. Looks like the lights(i.e. sun, moon and stars) can be enclosed or surrounded by something else (i.e. the firmament). The sun, moon and stars IN the firmament indeed. Rob, Here in the north of Sweden the sun can be seen for 24 hours at midsummer. I have always wondered why and how this could be. I have been listening to your arguments regarding FE and find them fascinating. Rhonda, You should also mention that you live in the DARK for 24 hours for a certain number of days. The 24 hours of daylight and the 24 hours of darkness happens repeatedly every year. Genesis / our Creator-God states that the Sun, Moon and Stars are there for several reasons, but to your 24 hours of daylight and 24 hours of darkness for several days every year, you need to recall that Yahweh told us that they were there to mark out days, months and years / seasons. How do you understand that SEASONS originate? What does the Sun have to do with SEASONS, YEARS, DAYS, MONTHS? What does the Moon have to do with keeping track of DAYS, MONTHS, etc.? How do the STARS help us to keep track of SEASONS, YEARS, DAYS, MONTHS? The Sun appears to move from South to North and back to South and North, again, yearly. The rays of the Sun are more direct during Summers, and less direct during Winters. Why is that? How does that happen? The Moon makes one trip around the Earth ~every month, ALL THE WHILE KEEPING THE SAME FACE TOWARD THE EARTH. Have any humans on Earth ever seen the back side of the Moon? Why is that? Does the Moon rotate on its axis? How fast does it rotate? The Stars / the Constellations of the Stars, are NEVER the same throughout the 365 days of our year. Yes, there are circumpolar stars / constellations which circle once every 24 hours at both the North and South regions of the sky. We can’t see them during the daylight hours, because of the brilliance of the Sun’s light, but they are still, apparently, moving around a central point once every 24 hours. Why do these circumpolar stars, APPEAR, to rotate once every 24 hours? If you live in the Northern Hemisphere, and you look SOUTH nightly, you will note that there are 12 Zodiac / Mazzaroth constellations which move from East to West, sequentially, over the 12 month period of our year. I was born in June. If I were to look South I should NOT EXPECT TO SEE The Twins, Gemini, because I need to wait for December to arrive, before Gemini will be directly South. Why is that so? Where has Gemini been when it was not visible in the night time sky in the Northern Hemisphere OR the Southern Hemisphere? These are all questions that the FE believers MUST answer. All of these questions have answers when you understand that the Sun is at the CENTER of the elliptical orbits of ALL OF THE PLANETS, the Earth included! The Earth’s AXIS is TILTED TOWARD the Sun during SUMMERS and AWAY FROM the Sun during WINTERS. During our SPRINGS and FALLS, the Sun is off to the SIDE of the Earth’s tilted axis. The orbit of the Earth AROUND the Star-Sun,CAUSES the DAYTIME Sun to out-shine the STARS which are hidden behind it. Therefore there are CONSTELLATIONS and STARS of the Mazzaroth, which CANNOT be seen when they are behind the Sun-Star. When the Sun is shining upon the Earth, whether in the Southern or Northern Hemispheres, yearly, there are ALWAYS portions of the Mazzaroth which CANNOT BE SEEN in the nighttime sky. It takes one full YEAR for an Earth-viewer to see each of the Mazzaroth constellations appearing during their nighttime. So when Gemini is smack-dab behind the Sun-Sol in June, NO ONE anywhere on Earth is going to be able to view Gemini in the night-time sky! You all know what causes DAY and NIGHT! You see the Sun rise in the East and you see the Sun set in the West. The Sun-Sol-Star rises from behind the HORIZON, and it sets behind the HORIZON, because the Earth is rotating on its axis, ONCE EVERY 24 HOURS. The rotation is from West to East. That is why the Sun and the Stars / Constellations APPEAR TO BE MOVING FROM EAST TO WEST. You can NEVER, EVER see the North Star from Australia! Why is that? You can NEVER, EVER see the Southern Cross constellation from Canada or Norway, or Chicago IL! I think that it is important to know the truth, thank you for sharing this so that I can praise YHWH for what is true. God bless you more. Promoting the spinning globe orbiting around the sun is the mother of all deceptions – an unrelenting psyop for 500 years in our Western civilization. The indoctrination has been deep for everyone. Christians have the advantage because the Bible supports the flat earth and the Book of Enoch in addition. I am surprised that Derek Gilbert has not yet received enough info or done enough research before commenting. Uncovering the stationary flat earth for people is worth the effort because the many other deceptions will fall like dominoes. P.S. I have found myself reading the Bible more than ever as a result of researching the flat earth. This has also made me more certain than ever about the evolution hoax and the ridiculousness of the Big Bang Theory. Thank you Rob, not only for your resilient dedication in spreading the truth of the bible, but also for you bravery and unwavering conviction that is attached to your beliefs. I struggle too with arrogance, though not on any comparable scale to you, and I understand how emotionally tolling it gets and for that, I thank you a million times over. You really are reaching and changing the hearts and minds of more people than any one ministry has dared to pursue. Stay strong and forever yourself, God Bless. If one goes towards the N. pole and time lapses the night sky, the Stars appear to circle overhead; So, if one goes to the S. pole and time lapses the night sky, one SHOULD see the same circling effect IF the globe Earth is true. But i have my doubts that will prove to be the case; there’s been enough time and opportunity for this experiment to have been performed; IF the “scientific” Globe Earthers had such conclusive evidence, they would have produced it long ago. BOTH the North and South Pole skies evidence CIRCUMPOLAR STARS! Thank you Rob…God blessing you and your family. Ever see a meteor fall upward? No one ever will either. Water will always find it’s level, not it’s curve. Water must be contained…whether that containment take the form of a cup, a bath tub, a pond, a reservoir, a lake, or an ocean. Without containment, the earth would be without form and void. Thank God for containment! What a fantastic, well articulated response to the errors of the behemoth SkyWatch TV in the Christian publishing industry. Similar as to Target and other corporations taking a stand on controversial political issues, SkyWatch should have stayed away from this topic until doing objective research. As you stated, this won’t end well for them. I bought many of their books and now consider their work suspect. I pray that they will put the truth of the bible at the foundation of their work instead of man made scientism. Derek Gilbert = 0 scriptural references = manmade opinions vs Rob Skiba = multiple scriptural references = most likely the opinions of the God of Abraham, Issac, and Jacob. Hi Rob, not sure if you’ve heard of the argument for flat earth from a 2 opposing pressure systems/atmosphere viewpoint? Meaning, earth having it’s own atmosphere, in order to sustain life….and then the vacuum called space? On a globe earth, they cannot call for a Firmament, a seal, as it were, to divide our atmosphere from space…but on a flat earth, the Firmament would rightly divide the 2 opposing pressure systems. See, for instance, a freezer……2 opposing pressure systems (inside and outside the freezer)……. Both exist only if there is a seal between the 2. However, remove the pipes from the back of the freezer (or just open the door), and the systems will automatically equalise….Hence…i thank God for our Firmament…..!!! No surprise about SkyWatchTV; thank you for your work, Rob. Thanks Rob for writing this! Josh peck just came out with another vid about the circle of the earth. 😔😒 I had to see if anyone had written on the fact that it seems like skywatch is very unreasonably biased when it comes to this topic. It’s a shame because they could be reaching a lot of people that are hungry for the truth. Thanks again your vids have been so very helpful in understanding what’s going on! I pray skywatch will have their eyes opened to the truth! And people especially the church would wake up!! God bless you! We can certainly pray bro. However, I seriously doubt that they would ever risk the massive loss in revenue if they were to even consider FE.